Works great, but confused over the ozone issue. Bad for me too...Loved it at first and now it just doesn't turn on! I highly recommend this product to asthmatics and allergy sufferers. We have both in out family and this technology has contributed greatly to our comfort in a variety of climates and environments. Within a couple of days of installation of the Ionic Breeze units the employees who were the most sensitive to air quality (including my spouse, the owner) experienced a marked change in the ease of their breathing. Now we live in Houston, Texas, and the air quality problems are entirely different. The combination of rain and heat and generally high humidity contribute to high pollen counts during the warm weather and mold when it's cool. We bought two compact units for the house, and we have had no respiratory problems in 9 months, even through allergy season. The only drawback to the units -- and it is as noticeable in the smaller as it was in the larger -- is that a working unit can give off a slight acrid, almost "burned" odor as it filters particles out of the air and emits ozone. We had a group of people here the other day and somone noticed the smell and asked if some bit of paper was burning. I have gotten so used to it that I didn't identify the source until later. I do not find it unpleasant, it simply confirms that the unit is doing its job and cleaning the air we are breathing. Makes your house smell REALLY clean! My wife and I really enjoy our Ionic Breeze 3.0 air purifier. We own a fairly small condominium downtown in D.C. and this unit seems to clean the air in the entire house. The air that flows from the unit smells really good, like the air after a really good thunderstorm, very clean and fresh, and ionically charged. We used the unit in our bedroom initially but the green light is a little bright for when you are trying to get to sleep. It is very quiet *until* it needs cleaning, then it sounds like a blank LP/EP vinyl record - it hisses and pops! The only thing that I wish was different: you cannot burn candles at the same time you are using this unit. It will ruin your Ionic Breeze - the particles of parrafin or beeswax will melt onto the electrically-charged plates and you won't be able to use it anymore. Helps me breathe at night ! DON'T BUY FROM THIS COMPANY!!! In early December I ordered products from Sharper Image as Christmas gifts. Half of my order did not arrive and I never received notice as to why. Turns out I had to call them to find out the items were on backorder. I finally cancelled the order and a month and a half later THEY STILL HAVEN'T REFUNDED ME! I acquired three of these units between 1999 and 2001 from my American Express Rewards program. My significant other read all of the ozone concerns, so we bought the $10 ozone guard a year ago. The guards seem to be dishwasher safe. Cleaning the main units is still a pain. The collection grids can be removed and I carefully run water over them directly. However, do not reinsert them into the main unit until the grids are completely dry!! I still haven't found a great way to clean the main unit. One time I tried using a Q-Tip soaking in rubbing alcohol to get in between the slits. Then I realized that life was too short for such work. Now, I use a feather duster and force it through the slits. It's still not easy, but if I do it every month, then the unit seems to stay and look somewhat clean. I did have two units stop working. In one instance, it was my fault. However, I was able to take both back to my local Sharper Image store and had new units instantly. The clerks never checked my receipt nor asked any questions. I have also heard that clerks will sell you an extended warranty for $20 and then replace your broken unit on the spot. This seems a good avenue for customer service. So if you have problems, try this approach before calling the company on the phone. I have had 3 of these running for the last few years and haven't had a single problem wih them. also I love them for the way they have made the air bearable. I had odors from glues paints and pesticides and that is all gone. I can even go through the winter without opening windows every day. I used to sleep with my nose pointed at the cracked window. How do people say this works? I would say this picks up 1/10 of 1% particles...at the most candle soot! I have owned mine for 1.5 years. Save your hard earned cash and seek other filters with Hepa. Still going strong.... knock on wood! I purchased the larger Quadra unit online more than 5 years ago, and I've never had a problem with it! Perhaps I've been lucky not getting a lemon, but it's been through 3 moves and my entire university career. I should explain that I've got pollen allergies, and this was the reason I purchased the unit. When at university, the apartment I was in didn't have air conditioning... i.e. no filtered air... so I figured that I'd give this a try. Not only did my apartment become sneeze-free, but as long as I slept with it on in the bedroom, it allowed my body to "de-tox" and get rid of the allergens, so I'd be able to go out the next day without any allergy symptoms. Actually, for the first year or so, it was in the living room, and my bedroom down the hall was still pretty much pollen-free! 5 years later, it's still working in my bedroom with the occassional static hiss (I can't be bothered to clean it weekly / monthly) and my seasonal allergies are nearly non-existent. Oh, that black icky stuff that people mention? I think that's the pollen and other nasties stuck to the ionising plates. There's dust, too. I have a problem with most air cleaners. As a light sleeper, the fan noise will wake me up in the middle of the night and I find it hard to get back to sleep. I went through a number of filters and ended up giving all of them away. The Ionic Breeze had the selling point of no fans so I tried one. I also live in a small apartment so the fan noise is much more noticable then in a house. It's absolutely true, the unit makes almost no noise. That's until it gets clogged with dirt or lint and starts to hiss, pop and whistle. Then it's as noisy as the fan powered filters. And sometimes cleaning the unit makes no difference, you just have to live with the noise until it goes away on it's own. Also some very small moths seem to be attacted to the collection plates, get electrocuted and the bodies stick to the plates. The dirt it captures is very fine not the fluffy clods of dust you get on ordinary filters so it's probably not capturing as much. It doesn't do much for cigarrette smoke but lighting candles will cause a film of wax to adhere to the collection plates. The wax can destroy the plates so it's recommended to not run the filter while burning candles. Electrostatically removing particles works okay, but it requires a fan to move air over the grille. As others have mention consumer reports tested this product at it removed almost nothing from the air. It rated the lowest out of all the air cleaners they tested. I purchased this after an informercial. My warrenty was for 3 years. Lucky for me, since 14 months after receiving the unit it died with no warning. The manufacture made me return it AT MY OWN EXPENSE and then they sent me a new unit. Took 2 months. Well, the new unit arrived 8 days ago. It died an hour ago. I called the customer service and refused to pay to send it back AGAIN. Meanwhile, I have nothing. After reading the reviews below, I could have kicked myself. I subscribe to the online version of Consumer Reports so did what another did...looked it up. 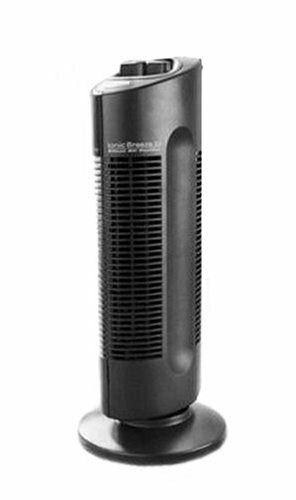 Consumer Reports says this Ionic Breeze only "removes a few particles from the air", nothing else. They also did the test, as the infomercial showed, of putting the Breeze in an enclosed space with smoke and turned it on. It did NOT do what the infomercial said. It did not "power through smoke". It did nothing. I am taking the advice of Consumer Reports. I am refunding my money on the Breeze and purchasing "the high-scoring Friedrich C-90A and Whirlpool AP45030HO models" which DOES work...and work well. Built like a 1980's American car! Like coming home to Sunshine!